There are a number of reasons a drink can be such a tonic. 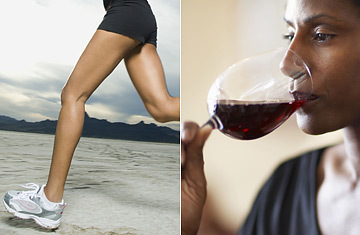 First, alcohol and exercise affect your heart health in similar ways. "They help increase good cholesterol, or HDL [high-density lipoproteins], and clean the circulatory system's pipes," says Dr. Arthur Klatsky, a cardiologist and researcher at Kaiser Permanente Northern California. "HDL helps remove fatty deposits, created by bad cholesterol, or LDL [low-density lipoproteins], from blood-vessel walls. The higher the HDL, the less likely vascular disease becomes. The lower the HDL, the more likely." Gronbaek and his team surveyed 12,000 people over a 20-year period. They found that exercise and drinking alcohol each had an independent beneficial effect on the heart and a compounded effect when practiced together. The investigators got even greater insight when they separated the study participants into four categories. People who don't drink at all and don't exercise had the highest risk of heart disease. People who drink moderately and exercise had a 50% lower risk. Teetotaling exercisers had a 30% decreased risk, as did moderately drinking couch potatoes. "There's an additional protective effect to doing both," says Gronbaek. "That's the new finding." This study is part of a growing body of work that makes a medical virtue out of what was once seen as a vice. There is evidence that alcohol in combination with caffeine can limit the damage to your brain after a stroke, even though it may not lower your risk of having a stroke in the first place. Other possible benefits include lowering your risk of diabetes, improving insulin sensitivity in postmenopausal women and decreasing dementia rates in older adults who had been consuming one to six drinks per week. Before you rush off to hit the bar after your workout, keep in mind that your age matters. Alcohol may do you no coronary good until you reach the age at which heart disease becomes an appreciable risk. "You wouldn't advise everyone to drink," says Gronbaek. "You shouldn't even think about doing it until age 45 or 50. There's absolutely no proof of a preventative and protective effect before age 45." Also, younger women who have a higher risk of breast cancer and anyone who has a family history of alcoholism should pass on the pint and order a soda. And remember, moderation is everything. Gronbaek's study, like most, stuck to the one-drink-a-day standard for women and up to two a day for men. It did not distinguish between type (wine vs. beer) or size (pint vs. shot). But here common sense must rule. A 10-oz. martini is a lot more than a 6-oz. serving of wine, even if they each fit in one glass. And it goes without saying that you should never drink your weekly allotment all at once.